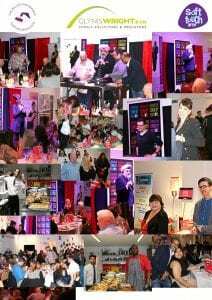 This year’s annual comedy dining event – Too Hot To Handle - sponsored by The Miller Partnership and Glynis Wright & Co Family Solicitors was a sellout success. For the third year in a row as part of Leicester Comedy Festival, Tracey and Pete Miller have made it their mission to put on a fabulous event and raise funds for Soft Touch Arts. This year we were lucky to have Glynis Wright on board, whose generous sponsorship made this year’s event break the fundraising record and nearly double the funds raised last year. Both Tracey and Glynis are Business Ambassadors for Soft Touch and give their time and experience to support the charity in so many important ways. As well as helping with fundraising and sponsorship, they spread the word about our work and raise awareness of the impact we have on the community. The event saw lots of local businesses turning out to support the event with 85 guests making the Soft Touch showroom hall very cosy indeed! Guests enjoyed a comedy cook-off between Pete Miller and Carl Mifflin judged by Shaf Islam from Chutney Ivy and our headline comedian Hardeep Singh Kohli. The 3-course dinner provided by Chutney Ivy was delicious and guests took part in a Spice up Your Life pop quiz, and a red hot chilli prize draw with fantastic top prizes on offer. Hardeep Singh Kohli had everyone in stitches and there was a lot of smiling and laughter throughout the night. The funds raised from Too Hot Too Handle event will be used to run the Soft Touch Kickstart Mentoring Scheme. This is a much needed programme which pairs young people who have had a difficult start in life with a trained mentor from the business community. Soft Touch is aiming to raise £10,000 this year to put 20 young people through a mentoring placement which lasts 6-12 months and helps them to get jobs or to go back into further education. We’re looking for more businesses in Leicestershire to sponsor mentoring places. In return you will get a specially designed brick-style panel displayed in the entrance hall of our centre on New Walk for all visitors to see. There are different options for sponsorship for 1, 2 or 3 years and lots of positive press and publicity, social media coverage, invitations to special events and acknowledgement of support on our website.